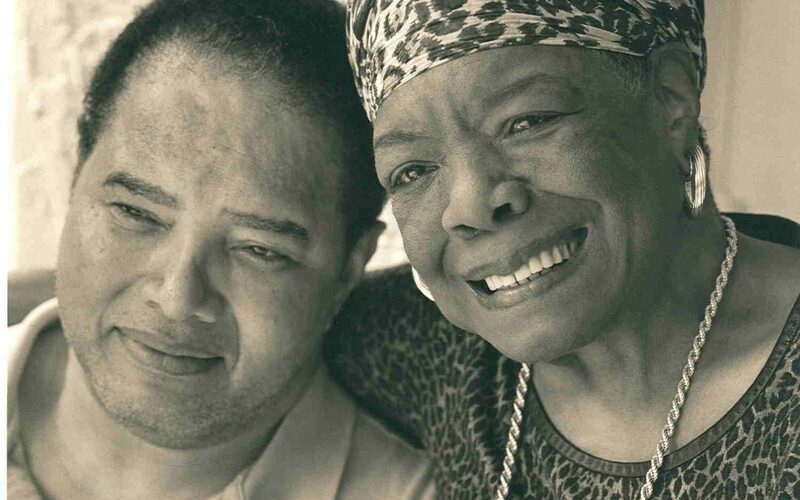 Welcome Letter from Guy Johnson, Maya Angelou’s son. Sometimes it is hard for me to entertain the fact that she is no longer here. I will come across an interesting item of news, or perhaps a really funny ‘clean’ joke and I’ll have the urge to call her. My fingers will actually touch the phone in anticipation of hearing her voice, her laugh or perhaps one of her insightful, succinct statements of wisdom. As I start to dial her number in Winston, a number that is forever branded in my memory, I recall that she has ascended beyond the mortal plane, that the voice I hear in my inner ear is ethereal. It is in such moments that I miss her most. running. That rooster chased me out of the yard, across the street and up a tree. Unfortunately, my choice of trees was poor and the branch I was clinging to broke. I fell to the ground hard, landing directly on the rooster. When I got up bruised and sore, I was initially pleased to see that the rooster was dead until I got home and told my mother. She made me retrieve the crushed bird, take it to the woman and offer to work off the cost of the rooster. That woman had me cleaning out chicken coops and mowing her yard for three months. After I finished working for her, I knew I’d never run from a damn chicken or anything else. While my mother’s poetry, her sayings and even her voice echo continually around us on Youtube, in newspapers and magazines, on bus stop shelters and even movies, it is sometimes difficult to process that the vibrant, larger than life personality that uttered so many gems of truth and understanding now only lives in our memory and in our hearts. Yet due to the complexities of being human she will be brought to life anew in the minds and hearts of future generations who never had the opportunity to sit at her table in intense discussion, who have never tasted or smelled the delicious dishes that she cooked so lovingly, who have never been surrounded by the various artists, thinkers, movers and shakers that she called her friends and co­-villagers, and never heard her voice impart the lessons she taught so easily. She was a great teacher and if we can keep her in print through the efforts of Caged Bird Legacy LLC, she will find many new students in the years to come. These new people who may not yet be born will be rejuvenated by her stories, her wit, her understanding, may even be brought out of the depths of their personal shadows and pain and lifted into the light of renewed spirit by her understanding of the human condition. Out of billions of human tramping feet which daily pound the earth of our planet, we who have crossed her doorstep, been in her presence, who have heard her call our name, who have eaten at her table, who felt her hand on our skin, we are few and the fortunate.